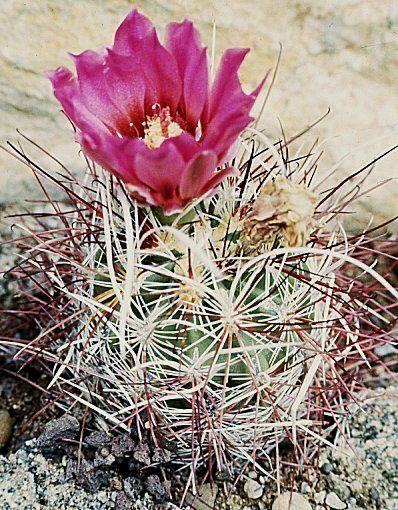 Britton & Rose, Cactaceae 3: 213, 1922. Type: Bigelow s.n., head of the Mojave, 15 March 1854 (MO). Echinocactus polyancistrus Engelmann & Bigelow, Proc.Amer.Acad. 3:372, 1857 (preprint, 1856); U.S.Senate Rept.Expl. & Surv. R. R. Route Pacific Ocean. Botany. 4:29 pl.2,f.1-2, 1857. 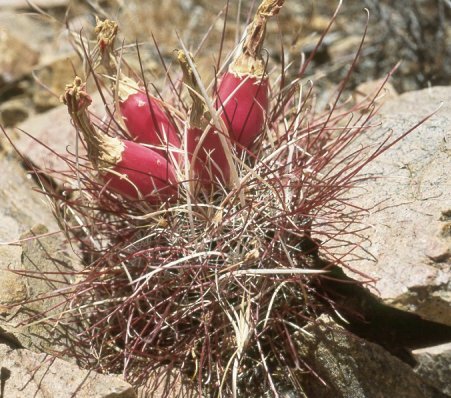 Pediocactus polyancistrus (Engelmann & Bigelow) Arp, 1972,Cact. & Succt. J. (US) 44:222, 1972.
fh 86.1, Randsburg area, 800m. fh 89, Nevada-California border, 1,300m.